Animals have long been part of the tradition of Japanese woodblock prints, spanning a variety of styles. Kuniyoshi created humorous depictions of the twelve zodiac animals, of playful anthropomorphic fish jumping around and of cats, either impersonating humans or freely being themselves. Hiroshige and Hokusai on the other hand, designed pure prints of birds and other animals often in combination with poetry. In the 20th century part of this ‘pure’ tradition of depicting birds and animals continues in the Shin hanga tradition. In the Sōsaku hanga tradition, however, a new trend can be seen: animals are shown in the countryside, in urban settings and as pets. 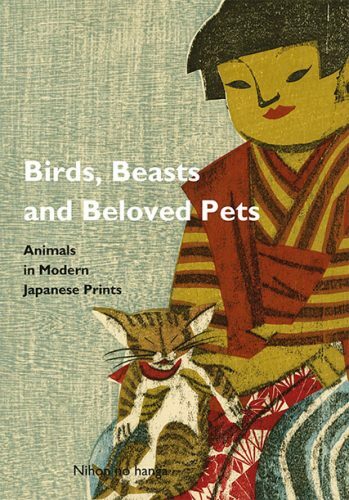 The use of animal motifs in design books and 20th century Japanese scroll paintings will also be highlighted. The exhibition is organised by theme, based on the animal’s role in the Japanese setting.